I need to get this little Pear and Spinach Salad out to the world before it is too late. 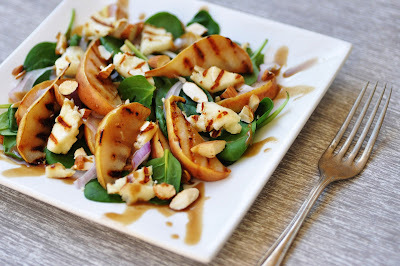 To me, it is the perfect starter salad for a Valentine's dinner: Warm and fruity pears, crunchy and fresh baby spinach topped with salty Halloumi, sprinkled with crunchy almonds and a drizzle of honey mustard vinaigrette. It is so exquisite and light in flavor, and the warm char-grilled pears and Halloumi are just right in the cold winter season. You'll have this and wonder why you don't have it every night because it is very simple and pretty quick to make. Start this salad by making the dressing. In a small bowl, combine all ingredients except the water. Add water until desired texture is reached. Set aside. Heat a dry char-grill pan until hot. Place sliced Halloumi cheese to the pan and cook about 2 minutes on each side, until charred. Remove from the pan and set aside. Cut each pear into 8 slices, then char-grill on each side for 2 minutes, or until charred. In a salad bowl, combine spinach leaves, red onion, pear slices and Halloumi. Drizzle over with Honey Mustard dressing. Sprinkle with chopped almonds. Serve immediately, while pears and Halloumi are still warm.